I generally choose to head to Shinjuku, which is packed full of department stores and high street shops. There are several enormous branches of Muji, a large (and loud) Topshop, a big Tokyu Hands and so on. I find Ikebukuro less appealing as an area -- it's something of a transport hub and not terribly attractive. It does, however, have some decent department stores which are conveniently located by the station. 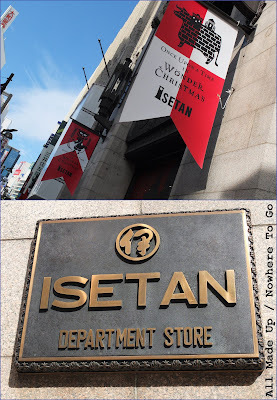 Isetan is a strong contender for my favourite place to shop in Tokyo. The Shinjuku branch, which was established in 1886, is the chain's flagship store. The beauty hall (on the first/ground floor of the main Isetan building) is not as capacious as that of Mitsukoshi Ginza, but it's a bit easier to navigate and equally stuffed with all my favourite brands. It can be a bit less overwhelming than Mitsukoshi so might be preferable for first-time visitors and jet-lag sufferers. As well as the usual high-end Western brands you will find counters for Addiction, THREE, Shu Uemura, Suqqu, Anna Sui, Sonia Rykiel and so on. Around the corner by the handbags and jewellery there is also a small perfume selection (with a large Jo Malone counter). Isetan recently re-opened a really excellent 'Beauty Apothecary' on floor B2 of the main building. This section stocks tonnes of brands, including lines such as John Masters Organics, Korres, Ila, Jane Iredale, Nuxe and Sundari. The Beauty Apothecary also sells products intended to promote 'inner beauty' - i.e. organic teas and foods, all imaginable brands of bottled water, etc.. The space is large and well-designed. Shopping in Isetan is a real pleasure. Note that Isetan is housed across more than one building and there is another beauty section in one of the off-shoot sites. The 'Beauty Park' (housed in Park City Isetan, around the corner from the main building) has counters for a number of high-end brands including Sisley, Cle de Peau, SK-II and De La Mer. My other (possibly most) favourite thing about Isetan is its proximity to a very tasty gelateria... Grom is located on the ground floor of the O1O1 (Marui) building opposite Isetan and, oh my, the gelato is good. Now it's colder they've also started selling the most delicious hot chocolate so I can barely keep myself away. Takashimaya is my newest discovery in Shinjuku. The department store chain was founded in Kyoto in the 1820s and the Shinjuku branch opened in 1996. Although the beauty section (on the first floor) slightly has the feel of a train station (it's huge with high echoing ceilings and seems a little under-populated), it has some decent brands and is a quiet and pleasant place to shop. Counters you will find in the Takashimaya beauty hall include Paul & Joe, Jill Stuart, Sonia Rykiel, Albion, POLA, Ipsa, Est, Cosme de Corte and RMK. It has the added benefit of a great purse emptier Kino Kuniya food shop in the basement selling all sorts of exciting (and expensive) yummies. There is also a big Tokyu Hands on floors two to eight of the Takashimaya building, including a cosmetics section with a large number of Western and Asian drugstore products (more on this in a later post). Note that both Isetan and Takashimaya Times Square are directly accessible from Shinjuku-sanchome station (as well as via several street level entrances). The Seibu department store chain was founded in in 1949 and the flagship is located in Ikebukuro (there are also branches in Shinjuku and Yurakucho). Seibu is owned by the same parent company as Sogo, another Japanese department store with a number of overseas branches (although many of these have been sold off, including the Hong Kong stores) and the Loft chain of shops. The Sogo & Seibu Company is in turn owned by Seven & I Holdings which also indirectly owns the ubiquitous 7-Eleven convenience stores. It's actually quite tricky (at least for me) to find the beauty hall when entering from Ikebukuro station as it involves walking through several departments and going up and down escalators. I find it easiest to exit the station and walk straight into the beauty department from the street. The beauty hall is expansive and well-stocked. All the obvious high and mid-end Western brands are there, including Chanel, Dior, Bobbi Brown, MAC, Guerlain and so on. Other counters include Addiction, Shu Uemura, THREE, Paul & Joe, Jill Stuart, Sonia Rykiel, Anna Sui, Cle de Peau, RMK, etc.. There is also a small section called the 'Organic Market' with lines such as Trilogy, Neal's Yard Remedies, Dr Hauschka, PHYT'S, Primavera and Senteurs du Sud. Just around the corner from this area are Jurlique, Origins and L'Occitane counters. Most of the Tobu department store in Ikebukuro feels unloved and outdated, but it does boast a recently revamped beauty hall which is worth visiting if you're in the area. It's usually quite quiet so makes for a peaceful shopping experience. Unlike Seibu, the Tobu beauty hall has a Suqqu counter. You will also find Anna Sui, Est, SK-II, Guerlain, Estee Lauder, Helena Rubenstein, YSL, Kanebo, Cover Mark, Laura Mercier and lots more. In common with most Tokyo department stores, there is a natural/organic products section with John Masters Organics, Erbaviva, SINN Natural & Organics amongst others. Tobu also has a small Hakuhodo counter, which carries a limited selection of brushes -- mostly travel sets, and some brushes from the S, G and J series. I was very excited to learn that there is a branch of Din Tai Fung in Tobu (on the 13th floor). I was completely obsessed with Xiao Long Bao in Hong Kong and I thought I'd discovered where to get my fix in Tokyo, but sadly it's not the same. The dumplings just weren't as delicious :(. As always, please do let me know if you have any questions or would like any further information on anything I've posted :).